Boost any young Padawan’s collection with LEGO® Star Wars 75214 Anakin’s Jedi Starfighter. The sleek shape of this instantly recognizable interceptor from Star Wars: The Clone Wars features retractable landing gear, an opening LEGO minifigure cockpit for Anakin to sit in, a clip underneath for his Lightsaber, a hidden compartment for extra ammo, space for R2-D2 and wing-mounted stud shooters. Price is 25% below the initial Lego retail price, a € 7.18 discount! This comes down to 8.90 cent per brick. The Anakin's Jedi Starfighter™ (75214) Lego set is available from the sites below. However, they do not offer delivery to your selected region. The Anakin's Jedi Starfighter™ (75214) Lego set is no longer directly available from the sites below. However, 3rd party partners of these sites might still have the set available. 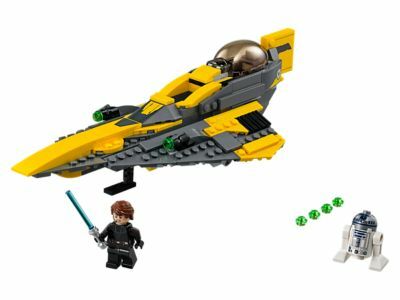 Alternate description Take to the stars with Anakin’s Jedi Starfighter! Includes an Anakin Skywalker minifigure and R2-D2 droid figure. Anakin’s Jedi Starfighter features retractable landing gear, an opening minifigure cockpit, space for R2-D2, a storage clip for Anakin’s Lightsaber, hidden compartment for extra ammo and stud shooters on the wings. Measures over 3” (8cm) high, 10” (27cm) long and 5” (13cm) wide.